Marketing technology is awesome. If you don’t already know this, there are some truly amazing tools out there for marketers. These tools are designed to help increase productivity and help you create remarkable content. We’ve picked five of our favorite (FREE) content creation tools that will help make your inbound marketing campaign shine. 1. Trello—an app that allows you to organize thoughts and collaborate with team members on certain projects. For example, you have a blog deadline coming up. You post some ideas, images, and other materials to Trello and share it with your co-workers so that you can collaborate on creating the blog. Really genius way of using a team to create remarkable content! You can also use it just to organize your thoughts—we do it all the time. 2. Hemingway—ahh, Ernest Hemingway. One of our country’s most prolific authors. It makes sense that this app was named after him. While it won’t turn you into Hemingway, it will help you hammer out some of the kinks in your content. Copy and paste a section of your blog, article, or whatever you’re working on into Hemingway. It will give you a readability score as well as pointers saying you used too many adverbs or you used the passive voice. It’s extremely helpful when you’re trying to craft remarkable content that your readers will enjoy reading. We typed in “billing solutions”Content Idea Generator gave us this blog title idea:11 Ways Billing Solutions Can Make You RichIt also gave us this:Why Billing Solutions Are Scarier Than Dating Taylor SwiftBut we opted for the former. 5. Canva—this image generator app is a serious game-changer for marketers who have little time and little budget to make impressive graphic images. There are so many customization options to creating banners, images, blog infographics, and so much more. What’s even better is that they have a great library of design resources to get you started. Take a look at this example we threw together. 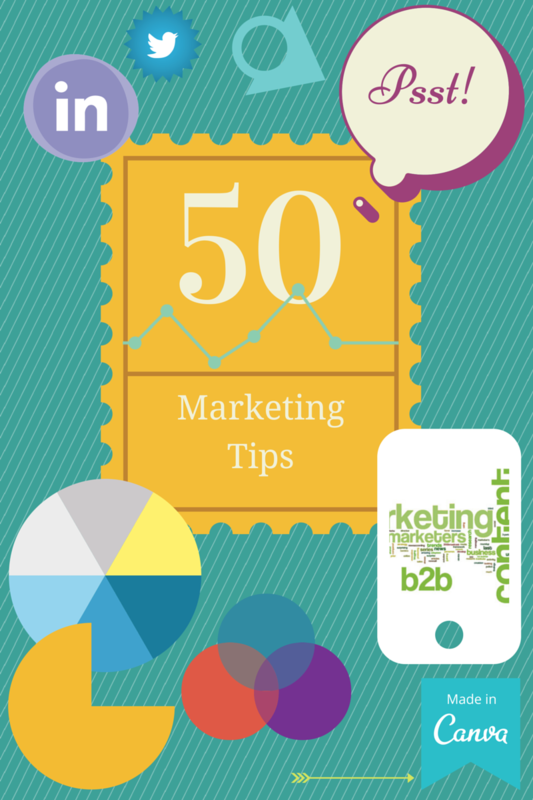 This could be the cover for a blog topic on “50 Marketing Tips”. Note: we added the “Made in Canva” sticker, you don’t have to do this. These five tools are actually amazing. We use them frequently and we recommend them to anyone who is looking for a leg up in the content creation game. They’re free…so what are you waiting for? !